Construction at Phase II & III of Patriots Plaza, the office complex being developed by Trammell Crow, at 4th & E Street is well underway. Phase I was completed back in 2005 and is fully leased with federal tenants, including FEMA. In total, the three buildings equal 1 million square feet of office space. Patriots Plaza is across the street from MPD District 1 Headquarters, which will soon move to the former Bowen Elementary School and be replaced by the city's new CFL. 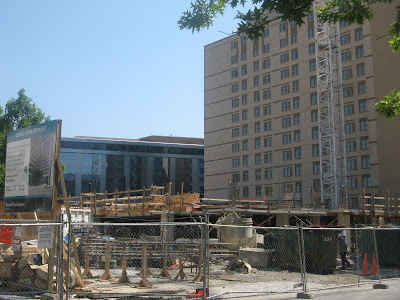 This is the Phase II building, when it reached ground level back in June 20, 2008 . 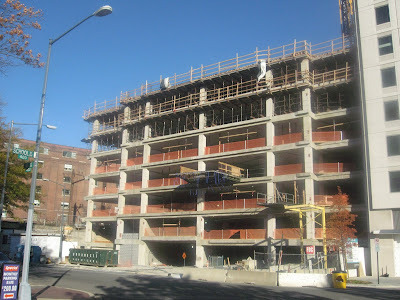 This photo from December 7, 2008 shows the Phase II building at the 12th floor, stepped back due to the building's size. 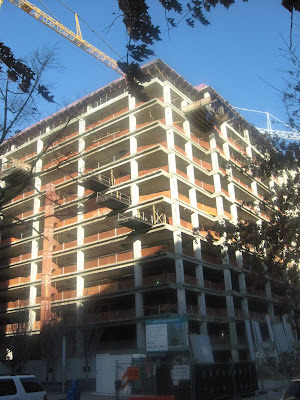 This photo from December 7, 2008 shows the Phase III building reaching the 7th floor. To the right is the edge of the Phase I building. Phase II & III are scheduled to be completed in 2009 and are seeking a LEED (Leadership in Energy and Environmental Design) Silver certification. So far, no tenants have been lined up yet for those buildings. Figured I'd let you know about a recent Bisnow article on this topic. Thanks for the Biznow link! National Mall on Inauguration Eve: No Camping!